To be honest I don't really read books as in novels anymore. I know it's not the same but I get my storybook fiction fix from watching movies. As a more visual person I am partial to books with a lot of pictures and illustrations. Not only do I enjoy looking at the images as I would a painting or photograph, I refer back to them for ideas when I design. A few notable design/fashion/art books that I've collected over the years or that I've been hoarding on my desk at work are Skin + Bones: Parallel Practices in Fashion and Architecture, Alexander McQueen: Savage Beauty, Memory on Cloth: Shibori Now, Avedon Fashion 1944-2000, and most recently Hussein Chalayan. 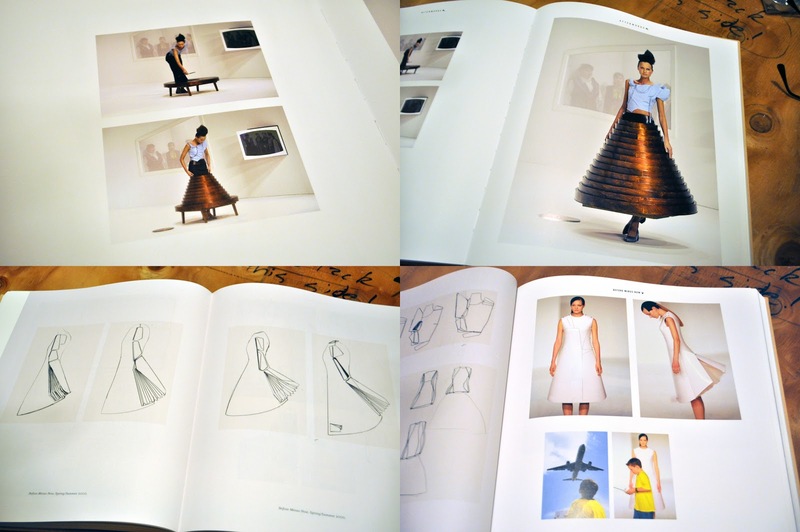 I learned about fashion designer Hussein Chalayan in college when a professor told me to look him up. He is a highly conceptual designer who melds architecture, fashion, and technology. His fashion show is often more similar to an art installation which explores an idea or emotion. This book includes many of his process sketches and design narratives which give insight into a truly original mind. Besides the books that I mentioned in my Coffee Table Reads, others on my radar include The Magic of M.C. Escher the ultimate graphic design book and The Shell: Five Hundred Million Years of Inspired Design because hey I love to collect shells. Looking back on my year of reading, I definitely enjoyed some good books. The bump in my reading rate is largely due to my friend Cindy's Christmas gift last year - the Kindle. Thank you, Cindy! For those of you who don't know, you can borrow books from the library. It really gives you a kick in the pants and increases your reading speed to a panicked 100 words per minute. Here are some of my favorites. By far, this is my favorite out of the books that I read this year. The book is written in the form of letters and set during/after World War II. It takes place on the island of Guernsey, which was occupied by Nazis during World War II. Without saying too much more, the charming characters, quirky female lead, history lesson, minor love story, and an orphaned child worked their magic and I fell in love with the story! I inhaled these books! This series is for young readers and the young-at-heart. I admit that I did in fact discuss these with my future nieces and nephews. If you're a fan of mythology, this is a fun and lighthearted reintroduction to Greek gods. I racked my brain throughout the books to remember "who was that god?" "who was that hero again?" Not all the books were extremely well written, but they were all filled with adventure and tons of references to Greek mythology. Nerd out. This is the first book of the series, and you are instantly impressed by the spunky mystery-solving, chemistry girl-genius. Set in England, also postwar, I definitely felt that my vocabulary expanded after reading this book. I really enjoyed this mystery, and it was such a refreshing take on the "mystery" novel. And finally, let's be a little festive shall we? David Sedaris is a master of comedic memoirs, and this book will have you dying of laughter. Let him recount his time as an elf, as you enjoy your hot chocolate and snuggle in your flannel pyjamies.